Install node.js from nodejs.org (use default settings). 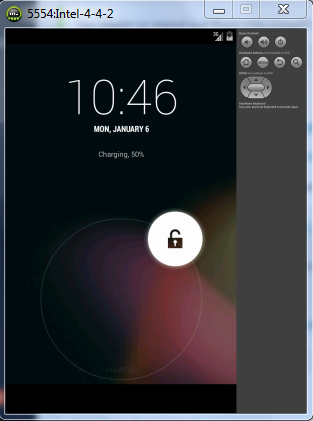 Now back in Eclipse (restart if you’ve installed the HAXM), you can go to Window > Android Virtual Device Manager. Choose a target (this is what you downloaded in step 4d). Provided you don’t see any errors, after a few minutes (be patient) you’ll have a working Android emulator going. Now, let’s do a quick project and test it! Go back to cmd (your command prompt). Now if you don’t already have your emulator running, go back into Eclipse into the Android Virtual Device Manager and start your device. That’s it; you should see “your” app on the emulator in a few seconds. (It reads “device ready” with a logo or something…). To get started creating your own app, browse to the folder (ie: \mobile\hello\www) and start editing and creating files. Enjoy! This is the holy grail. Would have saved me an entire day if I found it earlier. Glad to hear Joe. Good luck creating some awesome apps! are you maybe familiar with warnings like this (http://stackoverflow.com/questions/24799062/phonegap-3-5-0-version-warnings-in-opening-project)? I have followed your instructions but I installed only phonegap since I read on many pages that it is better to install just one, or am I wrong? After opening the project in Eclipse I got errors like I wrote in stackoverflow. Julie, I wouldn’t worry about these warnings. As long as they don’t turn into errors. Good luck with your project! Let me know if you run across any errors. sir while running command “npm install -g phonegap” on cmd, i am getting soo many errors like npm error not ok code. please help me sir in installing phonegap. No, that install should be fine. I would just make sure it’s been updated recently. Best of luck Arnold, you’re going to love it. Hi Chris. Hope you are doing great. How do I open apps(calendar) on windows phone 8 with Cordova/PhoneGap. My development has come into a situation where my app needs to interact with other apps on Windows Phone 8. Say when users click a button(in the Cordova which means it’s a html element) a windows phone 8 app will be opened(let’s say calendar). I have searched many hours and only found calendar plugins for android and ios, there is really no one for WP platform? Thank you so much for this. I’ve spent the last few days trying to figure this out and your tutorial helped me set it up. What do you get when you run “npm -v”? can you send me a link do that i can download phonegap.